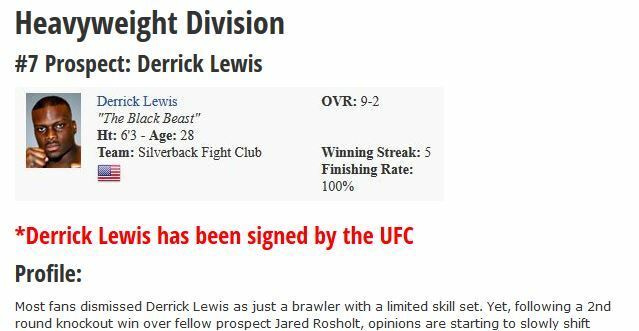 Most fans dismissed Derrick Lewis as just a brawler with a limited skill set. Yet, following a 2nd round knockout win over fellow prospect Jared Rosholt, opinions are starting to slowly shift towards Lewis making a run in the UFC in the very near future. Lewis grew up playing football throughout his youth, but he also found himself in his fair share of trouble, which was chronicled in his interview with interview with MMAjunkie. Lewis ended up serving 3 1/2 years in jail and upon his release in 2009 he began training at the Silverback Fight Club. Lewis went on to make his amateur debut later on in the year, though he lost due to a 2nd round cut. He won his next fight before deciding to turn pro in 2010. Lewis immediately began testing himself against some of the top Heavyweight prospects in the midwest. He scored an upset victory in his debut before losing a decision to future UFC veteran Shawn Jordan. Lewis bounced back in a big way as just one month later he traveled out to Colorado and stunningly finished current Bellator veteran Ryan Martinez. Lewis won two more bouts against tough competition, which resulted in him getting an opportunity in Bellator. Lewis was originally scheduled to face Thiago Santos at Bellator 45, but an injury to Santos, created a familiar scene for Lewis as he was considered a heavy underdog coming into his Bellator 46 fight with his new opponent, heavily hyped prospect Tony Johnson. Lewis gave it all he had, but he simply could not compete with Johnson’s wrestling, losing via unanimous decision. The fight heard its share of boos and both fighters never ended up competing for Bellator again. Lewis knew that his career was at a turning point coming off his Bellator release. In order to get another opportunity in a bigger promotion, Lewis would have to prove himself all over again. He got right to work, winning his next 2 fights via TKO. He briefly went on to compete in the Resurrection Fighting Alliance (RFA), where he once again finished a tough prospect in Justin Frazier. Following the win, Lewis returned back to Legacy FC and was given an opportunity to fight for the Legacy FC Heavyweight title against heavily hyped prospect Jared Rosholt. Rosholt was an All-American wrestler and was widely considered to be a lock for beating Lewis come fight night. Rosholt took him down early, but in the 2nd round, Lewis seized his moment, unleashing a flurry of punches that knocked Rosholt senseless. Lewis suddenly started to gain some hype outside of the midwest fight scene, but he was ultimately not signed by the UFC or Bellator. Lewis went on to defend his Legacy FC title against Ricky Shivers. The bout was not Lewis’ finest display of talent, but he eventually scored the win via 3rd round TKO. Lewis trains out Silverback Fight Club, which is located in Texas. It’s considered a solid fight camp in the midwest region with many of their fighters being featured in Legacy FC. Silverback Fight Club has not sent anyone to the UFC as of yet, but they had some of their fighters compete on Bellator and Strikeforce undercards. Lewis may not be as polished as other Heavyweight prospects, but you cannot doubt his heart or the wins he has earned. 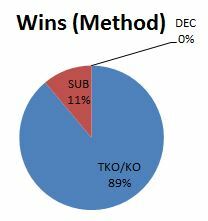 All 9 of his career wins have come via finish, and most were via brutal knockout or ground ‘n’ pound. What’s most impressive is that Lewis has never backed down from a challenge. He has consistently faced tough competition throughout his career and more times than not, he’s proven to people not to overlook him. Lewis is still somewhat one dimensional in his fighting style. He likes to brawl and would prefer to trade haymakers any day of the week, rather than fend for himself on the ground. He’s a bit of a slow starter and routinely gives up takedowns, but somehow he usually is able to turn the tide with his ability to get back to his feet and escape submissions. He may not be the most technical fighter on the ground, but thus far he has never been finished in his 12-fight professional career. Lewis has made it a penchant of his to go for broke especially when he senses his opponent is facing fatigue. Lewis has simply willed himself to win in some his bouts that have gone past the 1st round. Most Heavyweights have proven to have difficulties with their conditioning, and that’s exactly where Lewis has capitalized. Though Lewis has won many of his bouts by pushing through adversity, he does have his own limitations in the conditioning department. He is a times can be lumbering with his movement as he searches for that one-punch knockout. As previously mentioned, he gives up way too many takedowns and expends a lot of energy having to fight off his back and eventually get the fight back to a standing position. I’m not sure if that’s part of his gameplan, but Lewis simply cannot continue to rely on his ability to get back to his feet or saved by the bell. It’s hard to doubt him though after his comeback finishes of Rosholt and Martinez, and nearly pulling off the same result against Tony Johnson in Bellator. The one thing I have learned about Lewis is you can not count him out of any fight until the final bell has rung. I struggle to see him winning fights consistently at the UFC level, but I certainly think he is very capable of pulling off some big upsets. He’s got good size at 6’3 and 250 lbs. He’s at times hinted at a move to Light Heavyweight, but that is likely put to rest now with his win over Rosholt. I could see Lewis having similar success to that of a Matt Mitrione or Todd Duffee. Both are big strikers with some limitations surrounding their overall skills package. Lewis has the raw power and tenacity to knock out any UFC Heavyweight outside the Top 10. Lewis may struggle at times against more seasoned competition, but there’s no doubt he’s going to go out swinging for the fences until that final horn sounds.